Silent movie feateruring Charlie Chaplin his beloved character the Little Tramp as a lone prospector in the wild Alaska searching for gold and love. Chaplin declared several times that this was the film he most wanted to be remembered for. 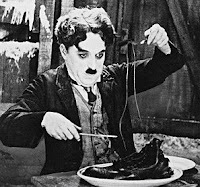 Scene: on Thanksgiving Day, determined to eat something, Chaplin boils his boot, accompanied with spaghetti-laces. Because of it's bright golden color a special type of Yellow Zucchini is called 'Gold Rush Zucchini', named after the Gold Rush in the 19th century which brought people from all over the United States and the world to the Californian West Coast in search of their fortune.